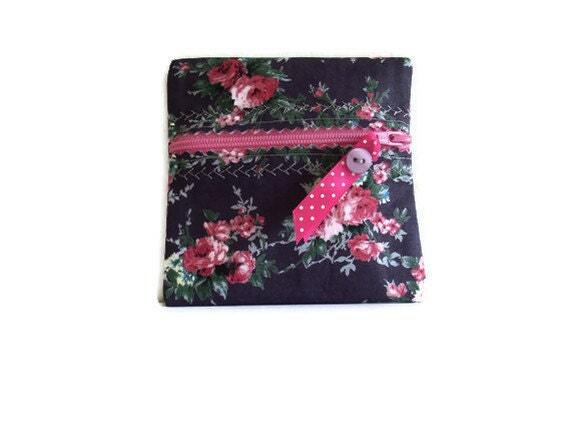 Little square coin purse crafted in a gorgeous Aubergine cotton poplin fabric covered in pink roses...... open the pink zip and you will see that it has been lined in a gorgeous pink cotton fabric with gerbera shaped flowers on....you can see the fabric in one of the photos. The edges of the zip have been sewn in pale aubergine thread and then a row of machine embroidery has been added on either side.. Have added some pink spotty ribbon to the zip pull. Have made this purse slightly differently to the turquoise one in that I have bonded the 2 fabrics together, so the purse has essentially been made with one piece of fabric....bonding makes the the fabric stiffer and you can see the seams inside which have been pinked.